Baan Oriental is changing this. Designed with luxury, pleasure and convenience in mind, the three-bedroom, 340 sqm home sits in a private 1,600 sqm garden setting with its own swimming pool and Jacuzzi. 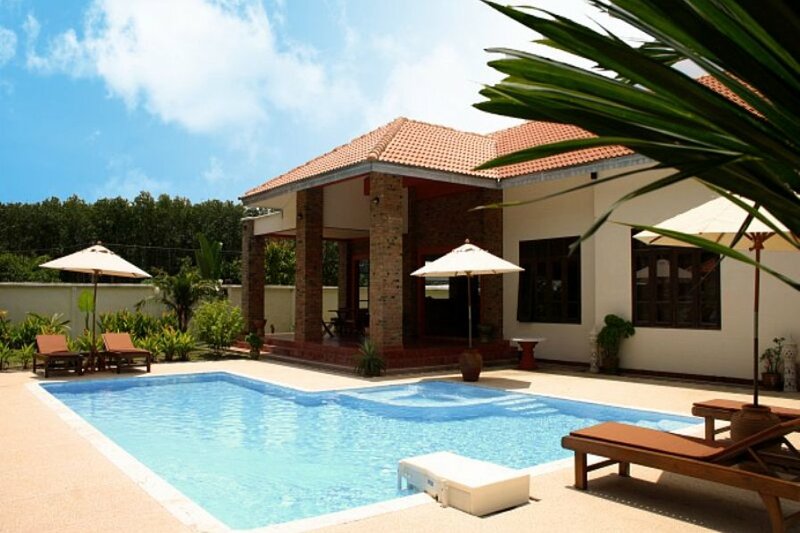 Baan Oriental is located about 3km from Ao Nang beach, in a quiet residential area close to local shops and markets. The villa is surrounded by a high brick wall for your privacy and is cleaned on a daily basis. The villas interior is a combination of Mediterranean and Thai chic: exposed brick walls and terracotta tiles give a rustic feel, while the high quality wood, bamboo and fabric furnishings are pure luxury. A stunning 340sqm Mediterranean-style villa, Baan Oriental features double height ceilings and large, open plan living areas to allow friends and families to enjoy cooking, dining and relaxing together, both in and outdoors by the private swimming pool with Jacuzzi. Air conditioning is provided in all bedrooms, as well as in the separate TV room with home theatre system. With 3 bedrooms and 3 luxurious bathrooms in the main building, plus a separate guest bungalow with ensuite facilities, this Krabi holiday villa also offers perfect peace and privacy for guests, at a short distance (3km) from Ao Nang beach. Those who do not have their own transport may use the unlimited taxi service (surcharge) from 9am to 10pm to get to and from the beach, and a personal concierge is also available to arrange door-to-door sightseeing excursions.